In Uganda, agricultural schemes introduced irrigation and rice mostly in the late 1960s and early 1970s. Three projects were implemented by the Chinese cooperation, reproducing the state farm model of the Mao era. Those schemes quickly fell aside as the country entered a prolonged period of political instability and violence. At the time, the “Green Revolution” was the dominant paradigm behind agricultural policies. In Sub-Saharan Africa, most of the large irrigation schemes were quickly considered as failures by the development sector as they did not meet expectations. Thus, most of them were either abandoned by international donors and states starting the 1980s or privatized, following structural adjustment plans. Agriculture was no longer a priority. Rather, it was left to the private sector which, according to the dominant liberalism paradigm, would be more efficient to integrate rural producers to market – thus stimulating an economic growth to their benefice2. However, since early 2000s, such schemes are once again becoming a significant public action among African countries, including in Uganda3. This paper, therefore, aims at understanding this revival of interest, a perspective at the crossroads of political ecology and political agronomy, in order to enlighten the current boom of projects previously considered as failure in the development sector. Therefore, it appeared essential for Museveni to gain the financial support of international donors to carry out the reconstruction process. At the time the concept of “good governance” was rising among international donors, linking together the state and institutional building process with efficient market economies and peace in a neo-liberal perspective. Consequently, rebuilding the Ugandan state with constitution-making came alongside structural adjustment plans’ implementation. Alongside dependency on aid and the extraversion which followed, the constitution-making process became an arena for distinct groups to raise their voices. Under pressure, the government abolished Idi Amin’s decree under which land was a nationalized resource. With both political opposition groups, who sought after recognition of their own indigenous land tenure systems, and international donors, for whom economic growth would come from private investments requiring access to land under freehold, Uganda eventually became one of the first Sub-Saharan countries to recognize plurality of land tenure. These include freehold, leasehold, the mailo system specific to the influential Buganda kingdom, and customary land tenure system. This was considered a political failure for Museveni, who wished to control land as the first economic resource in an agrarian society6. Since then land remains at the core of power relationships, the government’s attempts to amend the Constitution and struggles among all actors. Moreover, with the implementation of the structural adjustment plans, agricultural public action was left aside for private actors to stimulate thanks to a liberalized environment. Consequently, the Ministry of Agriculture (currently named the MAAIF for Ministry of Agriculture, Animal Industry and Fisheries) went through significant reforms and saw its budget and staff drastically reduced. As most donors during the 1990s ignored agricultural policies, the Ministry lost power and influence while others, such as the former Ministry of Natural Resources, rose according to the donors’ attention of the moment. While elaborating legal frameworks regarding land turned out strategic and political struggle, it was not the case with all resources. Neither water nor wetlands were subject to similar power balances. Nevertheless, the Water Act and the Wetlands Statutes, established during the 1990s, showed willingness to gain the support of the international community. Indeed, those policies are inspired by the international documents produced at and after the Rio Earth Summit in 1992. Thus, some of the Water Act articles are articles of Agenda 21. A significant number of articles of the Wetlands Statutes are directly inspired by the Ramsar Convention of 1971. Moreover, between 1987 and 1997, Uganda ratified about eight major international conventions, illustrating the willingness of the government to be part of the international community and gaining financial support from it by adopting it concepts and models. The transnationalization of the water and wetlands public action is also not a dynamic free from political influence. The boom of the water for sanitation sector that appeared during the 1990s in the development sector, with the acceptance on the Ugandan side of the main tools then internationally conceptualised, led to the emergence of an influential Ministry of Natural Resources (currently named MWE for Ministry of Water and Environment). On the other hand, while the “ecologization” of public policies was at the heart of international meetings at the time, implementation was lagging behind. This was reflected directly through the state building process in Uganda, which created an environment management authority but lacked the means to implement adopted policy and regulations. Eventually, elaborating legal frameworks for natural resource management such as wildlife, forest reserves, and wetlands, was inspired by the paradigm of conservation. In Uganda, land control is not unrelated to those policies. Though the government became a trustee of most of those resources – wetlands among them belonging to citizens for instance – it quickly acted as an owner, including for land grabbing cases or more simply in a strategy to build on legitimacy and state authority. 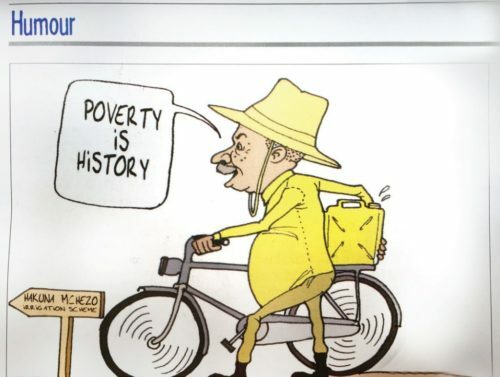 Although the NRM regime was initially popular, its credibility started to decrease as it failed over time to respond to hopes it previously rose. The establishment of a transparent democracy did not happen. At the opposite, it took ten years before Museveni consented to hold elections under the no-party system, which lasted until 2005. While the economic reforms seemed to kept inflation under control, allowing Uganda to reach one of the highest and longest lasting period of economic growth at the time in Africa, most of the population felt left out. Eventually the good economic results faded as inequalities deepened. Discontent grew toward an increasingly authoritarian government that failed to build a state outside patronage system, but rather used its power to maintain its leader and its position7. In one attempt to satisfy the population’s demands, a revival of “pro-poor” agricultural policies has appeared since the late 1990s, aimed to improving the livelihoods of a large sector of the population living in rural areas and/or that depends on agriculture. The ideology mobilised by those policies is the promotion of agriculture based on commercial principles, often called “agri-business”, relying on a value-chain approach and the private sector. In line with this, the FIEFOC (Farm Income Enhancement and Forest Conservation) programme was launched in 2008, mostly to “rehabilitate” irrigation schemes implemented in the 1960s-70s and late 1990s. Reinforcing state authority and legitimacy by forcefully producing new territories, using such projects to capture reluctant people’s votes in time of elections, are some of the underlying strategic issues of the FIEFOC programme8, renewed in 2015 as FIEFOC-2 to build five new irrigation schemes. However, “rehabilitating” came with land issue, a resource disputed at all scales. Indeed, land ownership constitutes a legal vacuum ignored by the government as the state forcefully imposes schemes in wetlands or on customary land, to name a few. This attitude is mostly perceived as land grabbing, fuelling conflicts and distrust within populations as well as toward the government. On the top levels, land ownership is deliberately left out from current policy-drafting in irrigation, allowing the government as well as donors not willing to deal with such sensitive issue to go on9. Particularly since the 2008 crisis, food sovereignty has been back at the core of numerous policies. Irrigation schemes are introduced one more time as solutions in the development sector. They are not only once again expected to allow reaching higher level of production, but also shifting from subsistence to commercial agriculture. Commodification and increase of production are the response to securing food production though weather hazards, in a neo-liberalised vision of agriculture and natural resource management. As agriculture is back among international donors’ priorities, mostly since the 2000s and with the promotion of “climate-smart” agriculture, the elaboration of climate change as a problem and the revival of irrigation schemes as a solution are under significant influence of donors, and therefore tightly linked to extraversion. As irrigation schemes are also costly agricultural development projects, governments willing to develop such public action need to capture international financial manna. Therefore, transfers of management models regarding climate change and water sector approaches illustrate the capability of the MWE in Uganda to adopt dominant tools and re-use them as a strategy to attract mandates under their wing. Thus, the MWE became since the 1990s, with the boom of the water for sanitation sector, a powerful actor. Nowadays the development of integrated catchment area approach, which mostly came alongside the establishment of the Nile Basin Initiative, and climate change related tools such as the National Action Adaptation Programmes of actions (NAPA), are successfully instrumentalized by the MWE to attract mandates in the irrigation sector or by the President himself in a populist communication strategy through mainstream media. Thus, adopting dominant paradigms of the development sector contributes to justify the costly and mediatized new public action for irrigation to meet productive goals. The FIEFOC and FIEFOC-2 programmes, funded by loans mostly from the African Development Bank (AfDB)10, opened the way to more significant actors who now wish to fund and/or build their own irrigation schemes: among others, the Japanese International Cooperation Agency (JICA), the World Bank, the Islamic Bank of Development, and private companies under public-private partnerships are now in the game, each one with its own interest and logic. Though achievements of the FIEFOC programme were questionable, the MWE remained the executive agency for FIEFOC-2. As the sector developed, intestinal struggles between the MAAIF and the MWE over mandates increased, illustrated by contested bids to control the drafting process of the irrigation policy and the national irrigation master plan. In the absence of an irrigation authority, the Office of the Prime Minister (OPM) is supposedly acting as a referee. However, its interests can also be questioned. Indeed, the choice of consulting and construction companies by the MWE seems to be linked to top-level civil servants of the MWE and to the immediate entourage of Museveni as well – for the latter, a construction company having its ban lifted shortly after unofficially getting, amongst others, a new contract through FIEFOC-2. Meanwhile, another significant private company, encouraged by the President himself during business meeting, is currently under negotiations with the Presidential office to establish private-public partnerships for unprecedented large-scale irrigation schemes close to the Tanzanian border and in the northeastern Karamoja. Nevertheless, the MAAIF still finds its way to attract mandates, mostly due to its long collaboration with the Japanese cooperation, though at a lesser extent. After a decade of focus on the rice sector and small-scale irrigation in the East, the JICA eventually conducted several feasibility studies, partly due to rising political pressure. For instance, the MAAIF is the executive agency for the implementation of the Achomai (80 million of USD) and the Namatala schemes (27 million of USD), funded respectively by loans of the AfDB and of the Korean Exim bank, both projects being based on the JICA studies but left aside by the Asian agency due to potential high level of conflicts. The MAAIF is also the privileged partner of the JICA concerning their grant of the 600 hectares Atari scheme, and of the Islamic Development Bank to which they applied for a loan to extend the existing and privately run Kibimba scheme (34 million of USD). While the MWE adopts a discourse based on climate change and integrated water management, the MAAIF rhetoric is based on the value chain and “agri-business” approaches inherited from the 1990s and reinforced since the 2000s. In the 1970-80s the reasons why irrigation schemes were considered as failures mostly lies in overly-technocratic conceptualisation, disconnected from the local dynamics, imposed from a top level ignorant of the pre-existing socio-economic structures present on the ground. Lack of local participation was pointed out, as well as the prominent political issues. In today’s Uganda, the booming irrigation schemes do not seem to demonstrate any change in terms of practices. The ideologies justifying such projects – now embedded in a wide neo-liberal vision of agriculture and resource management – are indeed new (climate-smart agriculture, integrated catchment areas management, value chain approach). However schemes’ conceptualization, as in the 1960s-70s, remains a technocratic process led at top level, excluding decentralised agencies and driven by interests hardly similar to the ones of the populations left to cope with the imposed schemes. Soft-components, though initially designed, are hardly implemented. The high level of corruption in the sector leads to incomplete or over-extended rehabilitations, while funders as governmental agencies ignore their unexpected and/or unwanted results. Moreover, the revival of interest for irrigation schemes leads to the multiplication of actors willing to enter the sector, and to different governmental agencies elaborating their own strategies to attract mandates. Eventually, those irrigation schemes, cast as the solution to Ugandan contemporary issues by all actors, are hardly different from the ones conceptualized decades ago. The political issues they serve, however, are specific to the period of Museveni’s leadership: maintaining a patronage system the NRM-state apparatus came to rely on; pursuing a populist strategy based on expressed need for water; controlling populations such as mobile groups or reluctant electorates; and controlling land by ignoring the ownership question at the top level of the government and donors’ community. As such, the contemporary making of the public action for irrigation in Uganda contributes to characterize an approach of the “Development” as a “perpetual present”. PhD Candidate in Human Geography at the University of Bordeaux Montaigne and Affiliated Researcher at the Centre for Basic Research, Kampala. 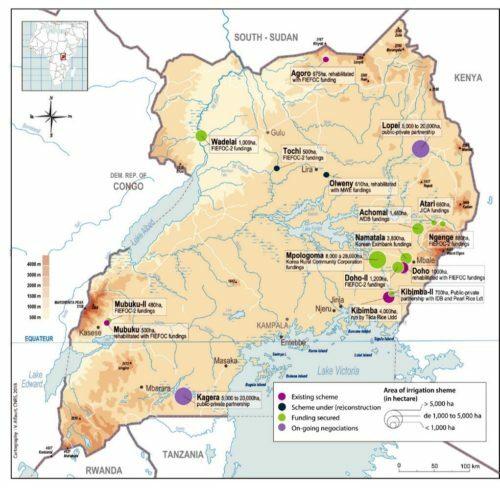 This paper is based on a fieldwork of 27 semi-directed interviews conducted between September and December 2017 in Kampala, and part of a wider research project focusing on the agrarian geopolitics of irrigation in Uganda. 1.Rist Gilbert, 2014, The History of Development: From Western Origins to Global Faith. London, Zed Books. Brelle François, Dressayre Etienne, 2014, “Financing Irrigation”, The Journal of Irrigation and Drainage, n°63, pp. 199-211. Lamwaka Caroline, 2016, The Raging Storm: A Reporter’s Inside Account of the Northern Uganda War 1986-2005. Kampala, Fountain Publishers. Gay Lauriane, 2014, “Enjeux de pouvoir et politiques foncières en Ouganda : la co-construction du chapitre foncier de la constitution ougandaise de 1995”, Les Cahiers du Pôle Foncier, n°7, 26 p.
For more details, see the concept of hydraulic territorialization developed by Pierpoli Faggi. To illustrate the impacts on the ground of the northern irrigation schemes, see Torretti Charlotte, 2018/2, “‘In the Name of Development’: Indigenous Resource Management in Irrigation Schemes”, Belgeo, Revue belge de géographie, 22 p.
Lewis David., 2009, “International Development and the “Perpetual Present”: Anthropological Approaches to the Re-historicization of Policy”,European Journal of Development Research, n°21, 32-46 pp.